Stress management is on everyone’s lips. Stress management should be as easy as possible – just easy – to make stress management easier. Easy stress management. If one believes current studies, a large part of the population is in stress. This refers primarily to the negative distress, which combines the known mental and physical stress: internal restlessness, concentration problems, sleep disorders, physical tension etc. The occasional pressure is normal. Not everything can be planned and sometimes everything comes at once. It is important, however, that this condition does not become a habit, because then threaten long-term mental and physical complaints. Prevention is needed. The benefit is recognized by the health insurance companies. Courses for stress prevention are subsidized accordingly. The present course is supported by the statutory health insurance. The amount of the refund varies. Inform yourself best directly with your health insurance. 1. Teaching the basic knowledge for the creation, maintenance and reduction of stress. 2. Short stress test to determine the individual stress level and the key starting points for improvement. 3. Practical explanation of the change of harmful thinking patterns that sustain stress (Ellis ABC analysis). Like all the courses that are offered here, this is also very participant-oriented. So there is the opportunity to introduce personal wishes and to complement the program accordingly. 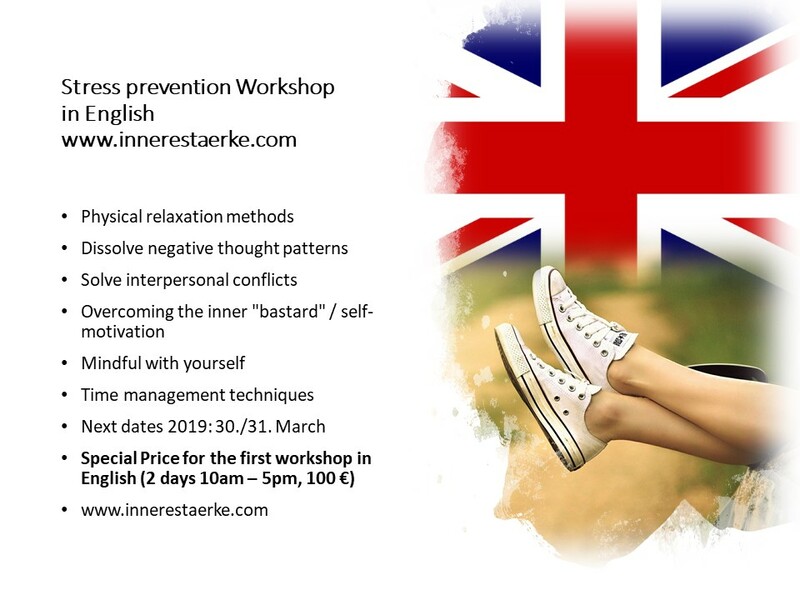 The next workshop is in Berlin on 30./31th of March 2019, 10am to 5pm, Saturday and Sunday.